You decide where to get on and off! Amsterdam is a vibrant city, with lots to see and do. The city has so much to offer that the average tourist quickly runs out of time, which is never a good thing. Naturally, you want to see as much of the city as possible. A great idea is to hop onto the Hop On Hop Off bus which will take you to all of the city’s most incredible places. Amsterdam has so much more to offer than the famous clichés of clogs, cheese and coffee shops. It is a city where you will find impressive architecture from the Golden Age, where the picturesque canal district will bring sensations of pure delight as you wander through its streets , where cultural highlights rapidly chop and change and where stunning districts such as the Jordaan are just waiting for you to discover them. There is so much to see! If you are visiting Amsterdam on a city trip you will want to get as much out of your stay as possible in a time frame which is always much too short. 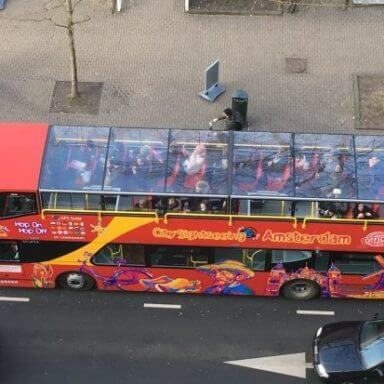 The Hop On Hop Off Bus is the easiest way to discover Amsterdam. Whether you are in the city for a few days or the entire week, the Hop On Hop Off bus is the obvious choice. Not only obvious due to its striking red colour, but it will also enable you to see as much of the city’s many treasures as possible. Of course, it is also a fun and relaxing way to get a good view of the city without having to worry about traffic coming at you from all directions. A chauffeur-driven luxury! Buy your tickets for the Hop On Hop Off bus here! Hop On Hop Off Bus Amsterdam has several stops, all of them at the most important locations. These modern city sightseeing buses are equipped with panoramic windows and a GPS guide in various languages which will give you interesting information about the sights along the way. You can hop in and out all day as often as you want, where you want. You simply travel from attraction to attraction. Perfect! All buses have WiFi so you can share your photos instantly! You will find it easier to pre-order your tickets online without having to find a point of sale once you arrive, meaning you can get on a bus and start your tour straight away. I bought my tickets here. There are various ticket options. Because you obviously lose time getting off the bus to visit the attractions, I opted for a 48 hour ticket and certainly did not regret it. 24 hour tickets are also available. Buses run from 9:15 a.m. If you want to see a lot, I advise you to start early. The great thing about a Hop On Hop Off bus is that you can decide where you get on and off and how long you stay at any particular attraction. You might want to step off and see the sights, carry on walking through that part of the city, then get back on the bus at a different stop. With a Hop On Hop Off bus, you can. When you book your ticket you will also receive a map showing the various Hop On Hop Off Amsterdam pick-up points. You can also download these onto your phone via the Google Playstore or the App Store. You will always know where to find a bus. During my tour I walked from the Jordaan to Dam Square and went shopping at the Bijenkorf. I then had a look the new church before swinging with David Bowie at Madame Tussauds, before walking to Centraal Station where I got back onto the beautiful red bus. As my feet were throbbing from all that walking, I stayed on the bus for a complete circuit. Anything is possible. You can plan your day any way you want to. A full tour of Amsterdam takes about 2 hours with the Hop On Hop Off bus. While you relax, you will see all of the city’s beautiful sights, at the same time being given information about every attraction via your headphones. This is the most relaxed way to see the sights! This lap of the city has no beginning, and it’s up to you when and where it ends. 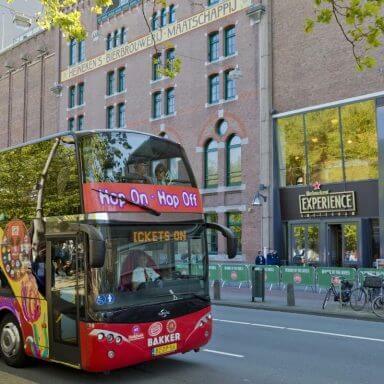 If you want to see the city from another angle, admire Amsterdam from the water by upgrading your Hop On Hop Off bus ticket with the Hop On Hop Off boat to make your tour complete. Each stop definitely is a must visit for every tourist and even residents alike. 647 visitors rated Hop On Hop Off Bus average 4.61 stars out of 5.